Be sure to get the most out of your system by taking advantage of RestaurantConnect‘s TableWatch features in ways you may not be aware of! 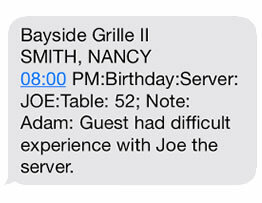 This new software feature will help you to get better restaurant management by keeping your team on top of potential situations that can often create missed opportunities for both VIP-guests and the not-so-well behaved visitors. Complete or update the form and be sure to select the “XXPM” checkbox. Rethink the XXPM functionality, as it’s usefulness reaches beyond getting an alert when a food writer or a repeat customer sits down to dine! What if your guest had a negative experience last time they were in the restaurant? What if another guest walked out on their bill? What if some guests have a habit of drinking too much on Saturday night? Wouldn’t it be great to be informed of all these nuances when there’s still time to be involved with what happens next, rather than finding out these guests were in the restaurant after it’s too late to be proactive? The above mentioned enhancement to TableWatch’s XXPM functionality gives you limitless possibilities, and will leave your customers wondering how your team never miss a detail. That’s better restaurant management! If you aren’t a TableWatch user yet, take a look at some of the ways we may be able to help you run a better restaurant!